Joan Evelyn MacGillivray, 76, of Belmont, MA passed away on Tuesday, March 20, 2018. She was born Joan Evelyn Dermody on December 19, 1941, in Boston, MA, to Harry and Evelyn Dermody. She was the middle of five children, and grew up in Manchester-by-the-Sea, MA. Jed, as she was known to all of her family and friends, graduated from Manchester High School in 1959 then went on to study art education at Marywood college. After graduating Marywood in 1965, she went on to study painting at Pius XII Institute in Florence, Italy. She spent a year there studying and exploring Europe as she gained her masters degree. When she moved back to the US, Jed got a job teaching art in Manchester. She often spoke of the art teacher whom she worked with, and how that woman gave the students freedom to explore art how they wanted, something that would influence Jed’s approach to both teaching and parenting. Jed would spend the next four decades working as an educator in various settings, including teaching art classes, running clay programs, as an after school teacher, and working with young children. While working in Manchester, Jed met Elise Lockhart, who would become her long time, closest friend. Elise introduced Jed to her future husband, Donald MacGillivray. Jed and Don were married in 1969, and had a son, Michael, in 1976. They remained married until Don’s death in 2017. As a new parent, Jed joined a babysitting coop of local families. From this, she began her own home-based playgroup for kids aged two to four years. This would become her life’s work, and the focus for her passion for arts and teaching. During this time, she also worked at the Fayerweather Street School in Cambridge, then at the Wellington School after care program in Belmont, where she became the lead teacher. Jed loved kids, and saw all the good and wonderful aspects of them. She gave them lots of projects and supplies to work with, and also gave them lots of freedom. She firmly believed that kids should be able to guide their own learning and exploration of the world, with adults serving as mentors and supports. The kids who came to her playgroup had a wonderful time, and the house, and yard, were constantly filled with the sounds of laughter and joy. Jed was also a great support and resource for the parents who brought their children to her. She was always available to talk, whether in person or over the phone, and her years of experience gave her a great perspective on both children and parenting. She was quick with a story or anecdote relating to whatever concern a parent would bring to her, and would reassure those parents that what they were going through was normal, and that their kid would be ok. She touched countless lives through her work, and was beloved by those who met her. Jed was diagnosed with pulmonary fibrosis, a degenerative lung disease. Though her health was in decline for a few years, she never lost her loving spirit, her sense of humor, or her desire to help others. She died peacefully, and was able to say her goodbyes to many of her friends and family. She is survived by her son, Michael, daughter-in-law Sarah, and granddaughter Rory. She is also survived by her two sisters, Marianne and Maureen, as well as cousins, nieces and nephews, and other extended family, in addition to all those whose lives she touched. She will be greatly missed. 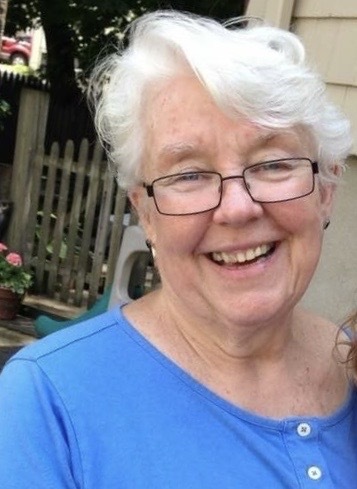 In celebration of her life, a memorial party will be held at the Scottish Rite Masonic Museum and Library at 33 Marrett Rd in Lexington, MA on Sunday, April 22nd from 12-3pm. In lieu of flowers, donations can be made to The Pulmonary Fibrosis Foundation (http://www.pulmonaryfibrosis.org/ways-to-give/donate-now) or Cradles to Crayons (https://www.cradlestocrayons.org/donate-now/).